How long can you get by on nostalgia and retro signifiers masquerading as depth in your lyrics? 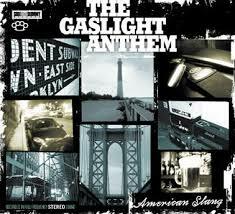 Well, the Gaslight Anthem is going to find out. After their breakthrough, The '59 Sound, the Jerseyian punks appear to have taken a Green Day-like career shift: finding a concept that struck a chord and beating it to death like one of the down-and-out ciphers in the B-movie quality Springsteen worldview they've constructed. And it looks like we're going to have to deal with a Killers-style romanticization of American decay (and characters lamenting how much better things used to be!) without any of the fun (hooks, sing-along choruses, etc). This leads to the aforementioned "fevers" chorus. Can you picture the 20 seconds of your life I just saved you from? Immediately following is the one stylistic shift, "The Diamond Church Street Choir," which has the same sort of impact as '59 Sound's "Miles Davis and the Cool," and for one brief minute the Gaslight Anthem makes sense. They slow down and strip out some of the more egregiously generic stuff and it's just Brian Fallon's Bob Seger-throwback affect and a Motown-acting rhythm backing. Ain't innovative, but I'll take it. Then they're back to tired also-rans and leftist sloganeering that may be exciting to anyone whose parents didn't play them Born in the U.S.A., but is to the point of annoying and depressing (more that they couldn't think of a new way to express this stuff than anything to do with the melodramatic content) to the rest of us. Luckily, the success of '59 Sound hasn't inspired much in the way of anticipation aside from their built-in fanbase and some fluke critical acclaim, so you should be able to avoid the generic guitar parts, the vocals dipped in just enough echo to crack with the proverbial screen door in "Born to Run," and especially the overwrought lyrics. Unless you're having trouble sleeping. Then by all means, put this one on.